At the November meeting of the California Water Commission, agenda items included an overview of the SB 606/AB 1668 water conservation legislation which was passed by the legislature and signed by the Governor earlier this year; Commission staff also gave an update on the Water Storage Investment Program, including the status of the contracts for administration of public benefits. As the effects of climate change impact the state’s water supplies with longer droughts, destructive wildfires, more intense flooding, and shrinking snowpack, being efficient with water use is going to become critical. In recognition of this reality, the legislature passed SB 606 and AB 1668, which Governor Brown signed into law in 2018. The legislation was a result of an Executive Order from the Governor during the drought which required the Department of Water Resources, the State Water Resources Control Board, and three other state agencies to develop and recommend a long-term water conservation framework to provide a road map for all Californians to work together to ensure adequate water supplies for now and in the future. 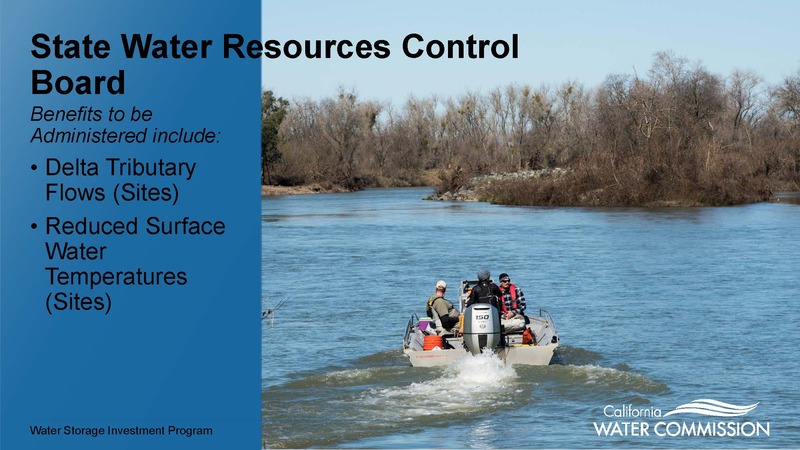 At the October meeting of the California Water Commission, Diana Brooks, Chief of the Water Use and Efficiency Branch at Department of Water Resources, gave a broad overview of the new legislation. Ms. Brooks began by noting that a number of actions and events preceded the passing of the legislation, beginning with the drought state of emergency that was declared in 2014, the development of the California Water Action Plan, the passage the Sustainable Groundwater Management Act, and the passage of Prop 1. 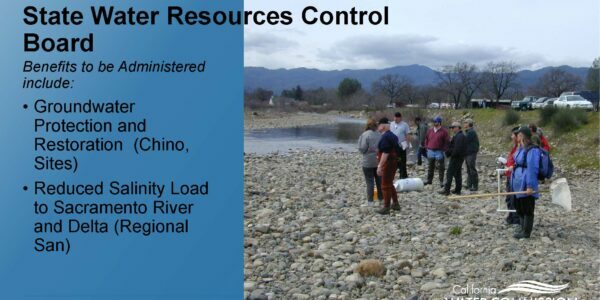 That was followed by a couple of executive orders, one calling for a 25% mandatory cutback in water use in 2015, and another in 2016, ordering DWR, the State Water Board, and three other state agencies to develop and recommend a long-term water conservation framework. The agencies worked with stakeholders for 8 months, producing a final report in 2017 that became the basis of the legislation. SB 606 by Senator Hertzberg and AB 1668 by Assemblymember Friedman were passed by the legislature and signed by Governor Brown on May 31st of this year (2018). The two bills work together as a package as they provide complementary authorities and requirements. 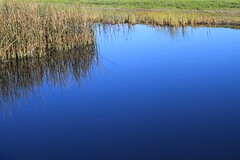 The legislation covers both urban and agricultural water conservation as well as drought planning; it will affect urban water suppliers, agricultural water suppliers, small water systems and rural communities. 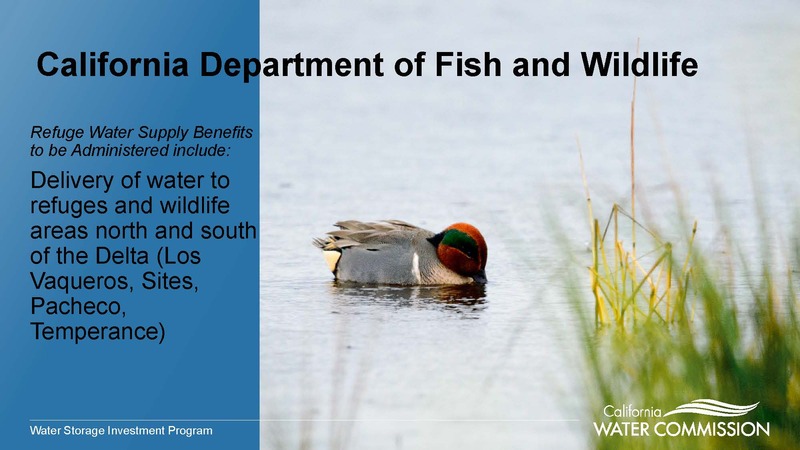 The legislation does not change the existing water conservation targets that were set under the SBX 7-7, which is a 20% reduction in per capita water use by 2020; meeting those targets is still required. 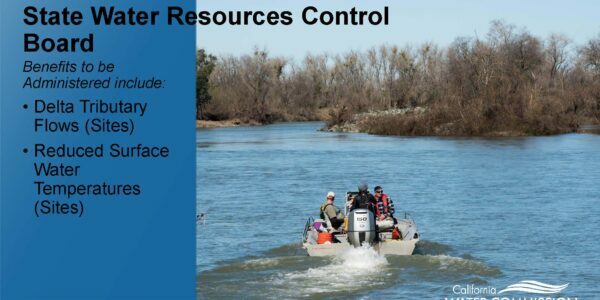 Rather, the new legislation sets new water use objectives based on efficiency standards that exceed the conservation required by 20×2020 target and includes provisions for commercial, industrial, and institutional performance measures. The legislation also requires more robust water shortage contingency planning and drought risk assessments, as well as drought planning for small systems in rural communities. 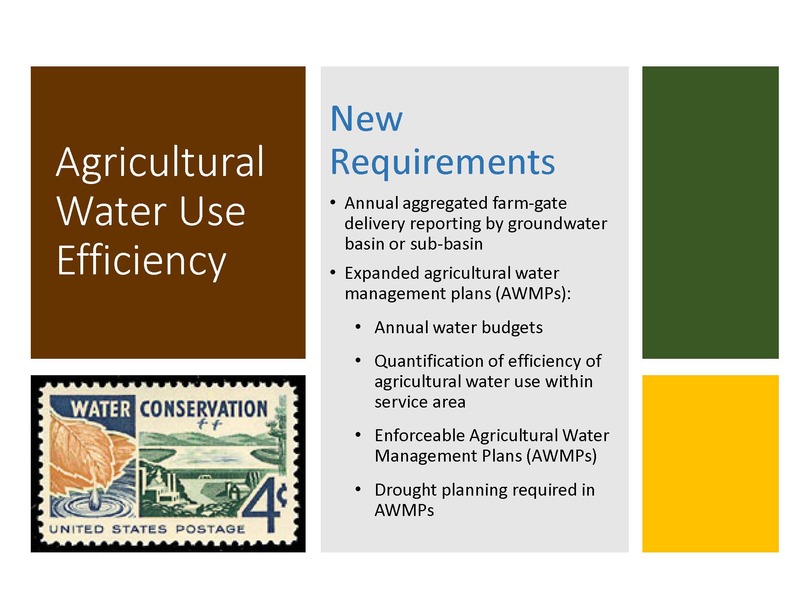 There are also enhanced requirements for agricultural water management planning. In 2016, the water suppliers submitted the urban water management plans which showed that by 2015, the state was well already ahead of the goals set by the 20% by 2020 legislation. The 2015 interim milestone was set to 159 gpcd statewide, and the data showed it was actually at 133 gpcd. 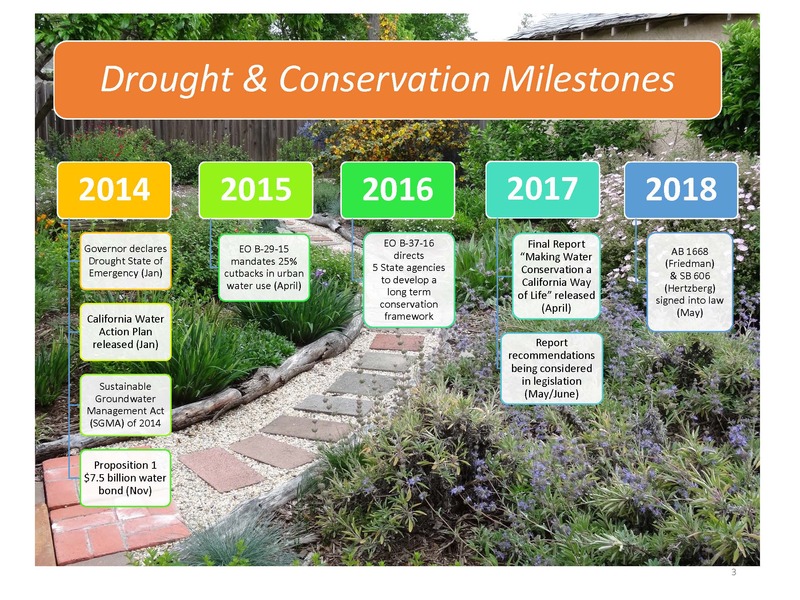 The mandatory cutbacks ordered as part of the drought emergency certainly impacted water use somewhat, but the data showed the state was sufficiently ahead to meeting that 2020 goal that it didn’t seem like a stretch anymore. 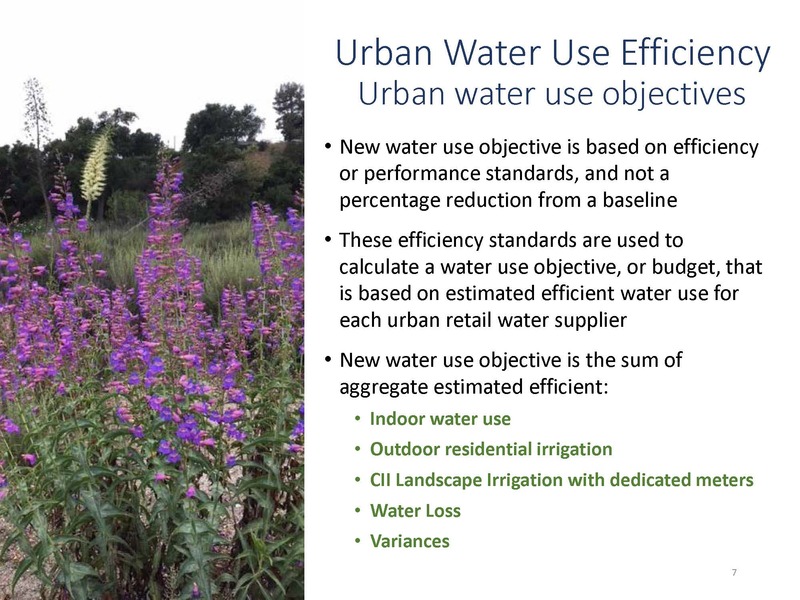 DWR and the Water Board will develop efficiency standards which will be used to calculate the new water use objectives or the water budgets for each urban retail water supplier that will be customized to their area. 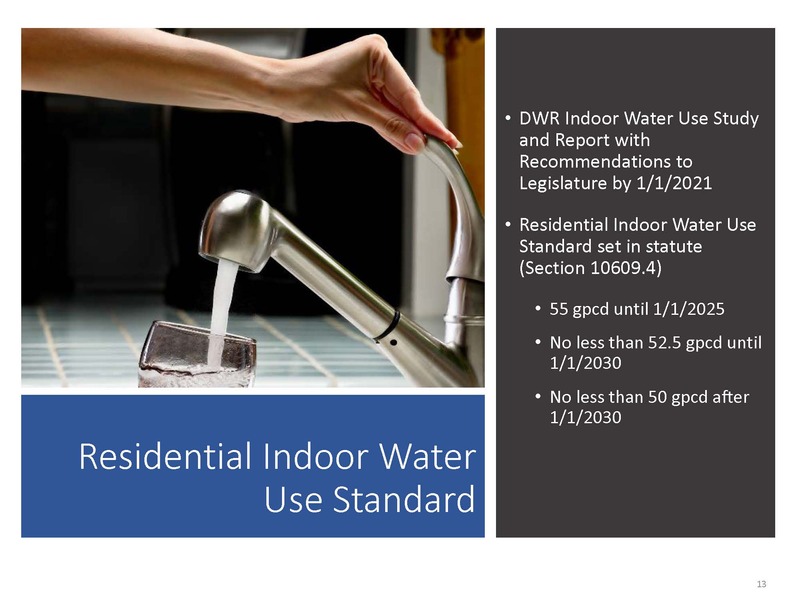 The indoor water use standard is set in statute; the outdoor water use standards will be developed by DWR and State Water Board staff and will be presented to the State Water Board for adoption in 2022. The legislation also has performance measures for Commercial, Industrial, and Institutional (CII) landscapes that are irrigated with dedicated meters. 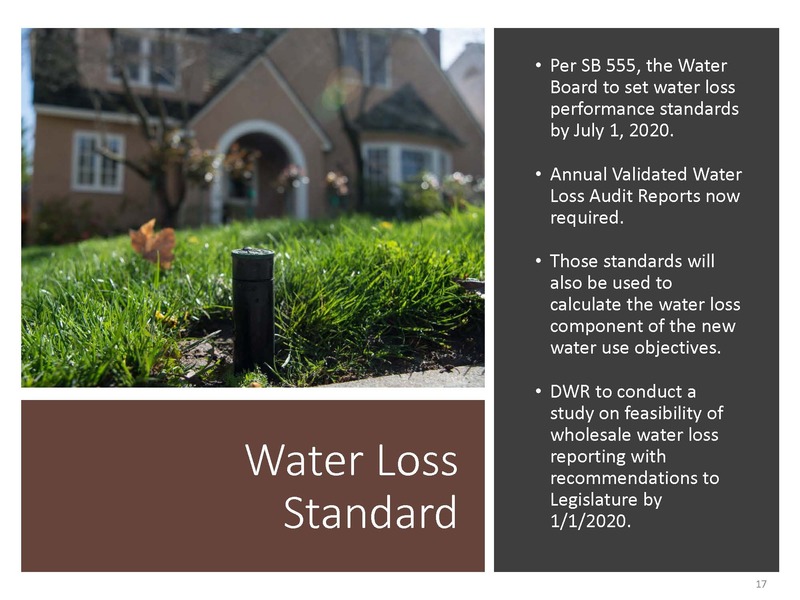 There is a distribution system water loss standard that’s already in development; the State Water Board will be adopting a standard by July 2020 that will be a factor of the new water budgets. 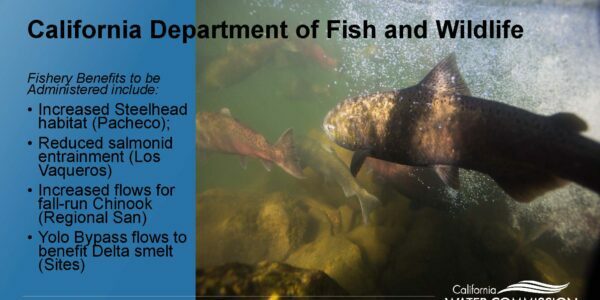 The legislation also specifies variances for unique water uses, such as a lot of large animals, seasonal populations, or swamp coolers. 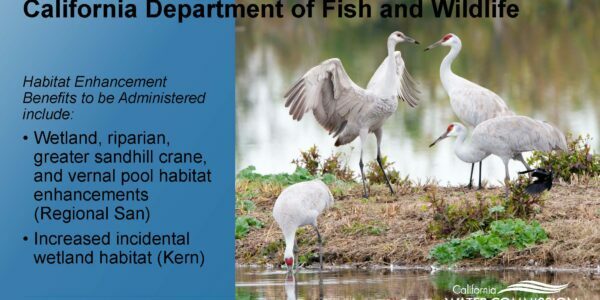 The Department of Water Resources, the State Water Board, the California Department of Food and Agriculture, the California Public Utilities Commission, and the Energy Commission have been working together to coordinate and implement the legislation. 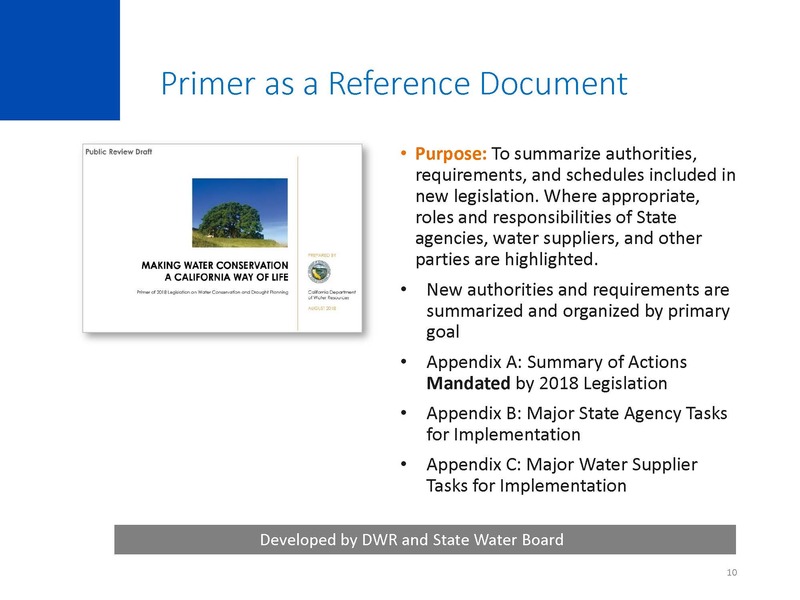 The agencies have put together a primer, Making Water Conservation a California Way of Life – Primer of 2018 Legislation on Water Conservation and Drought Planning, Senate Bill 606 (Hertzberg) and Assembly Bill 1668 (Friedman), which outlines the key authorities, requirements, timeline, roles, and responsibilities of State agencies, water suppliers, and other entities during implementation of actions described in the 2018 legislation. The primer is intended to serve as a reference document for implementing the legislation. Ms. Brooks then turned to the urban water use objectives in the legislation, noting that the new objectives present a fundamentally different paradigm for water conservation than what the state has had up until now. The Department of Water Resources is developing outdoor water use standards for both residential and commercial landscapes with dedicated meters. For residential customers, there is a statewide landscape area measurement study underway that will be measuring over 400 urban water suppliers’ residential landscapes and providing that information to them by January 2021 at the parcel level of accuracy, which is what is specified in the legislation. The Department is using remote sensing that can distinguish between native lands and grass, what is irrigable, what is irrigated; that data will then be used to come up with a standard for efficient outdoor water use in the state. The legislation requires the Department to incorporate the principles of the model water efficient landscape ordinance; the budget that water suppliers will receive will be customized to the evapotranspiration in that area, she said. 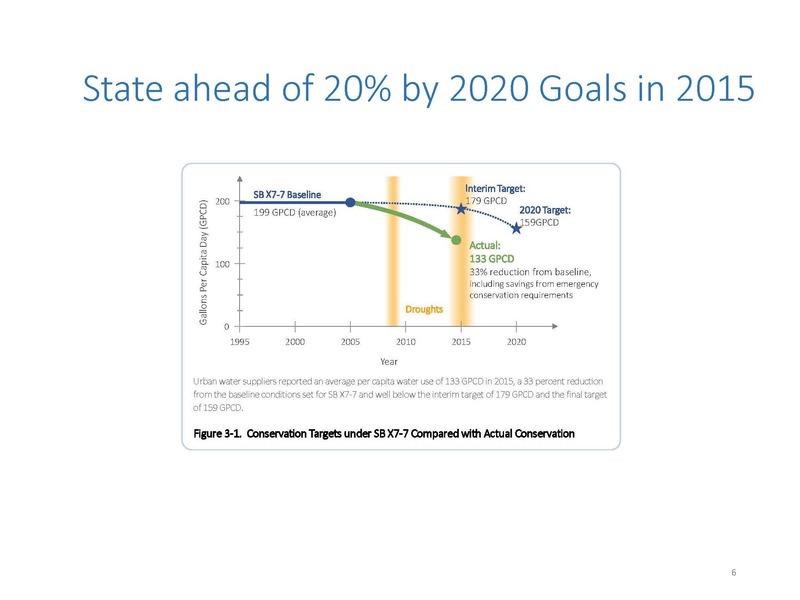 The Water Board will set water loss performance standards by 2020. This new legislation specifies that those same water loss performance standards be used in the development of water budgets for the water suppliers. The Department now receives annual validated water loss reports for the urban retail water suppliers every October; the legislation also tasks DWR to conduct a study on the feasibility of extending those requirements to water loss reporting for wholesalers; that report is due in January of 2020. 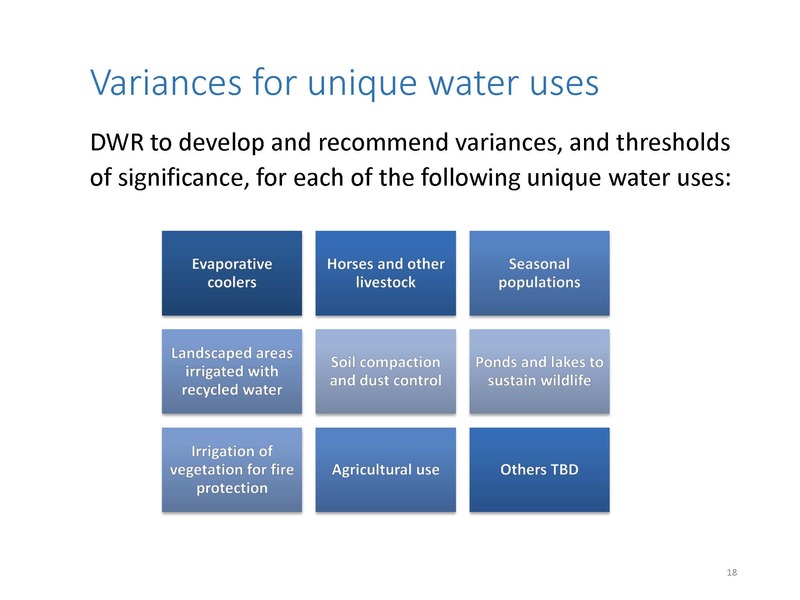 There are variances for different types of unique water uses, such as evaporative coolers, horse and livestock, or irrigation of vegetation for fire protection. 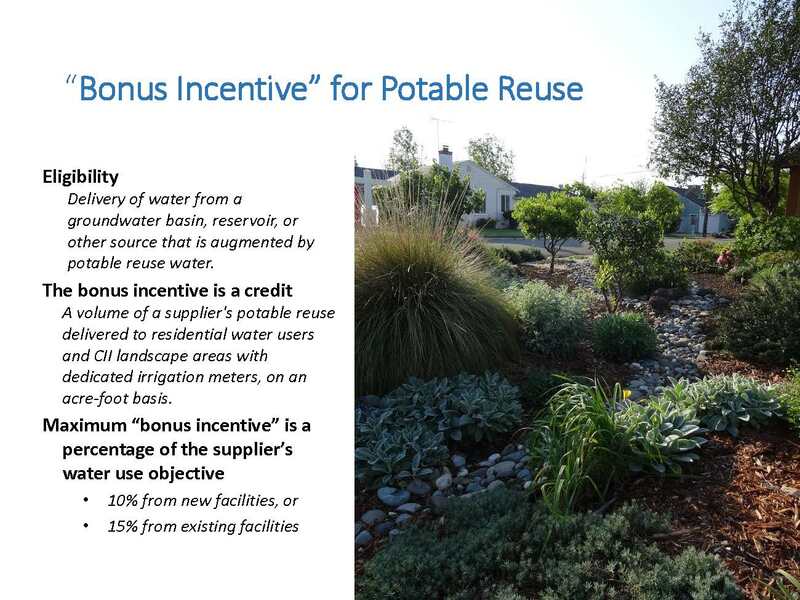 There is also a bonus incentive for potable reuse; the legislation wanted to recognize the value of water suppliers investing in recycled water and potable reuse, so suppliers can get a bonus, much like a credit, towards meeting their water use objectives. The water use objectives will be calculated by adding up all of the components for indoor, outdoor, CII, the water loss, and variances, and then adjusting it with any potable reuse credit. 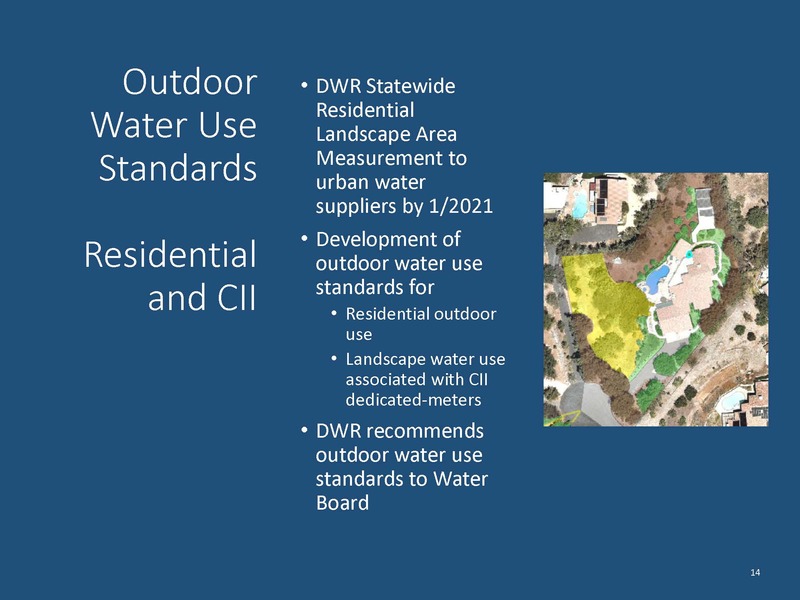 The performance measures for Commercial Industrial and Institutional (CII) landscapes don’t lend themselves to a volumetric target because the CII sector is varied, so the legislation calls for DWR to perform studies and develop recommendations that include CII water use classification system, setting minimum size thresholds for converting CII mixed meters to dedicated irrigation meters, and CII best management practices; this is due by October 2021. The legislation has requirements for urban water suppliers for drought contingency planning, as well as requirements for county planning for small and rural systems. 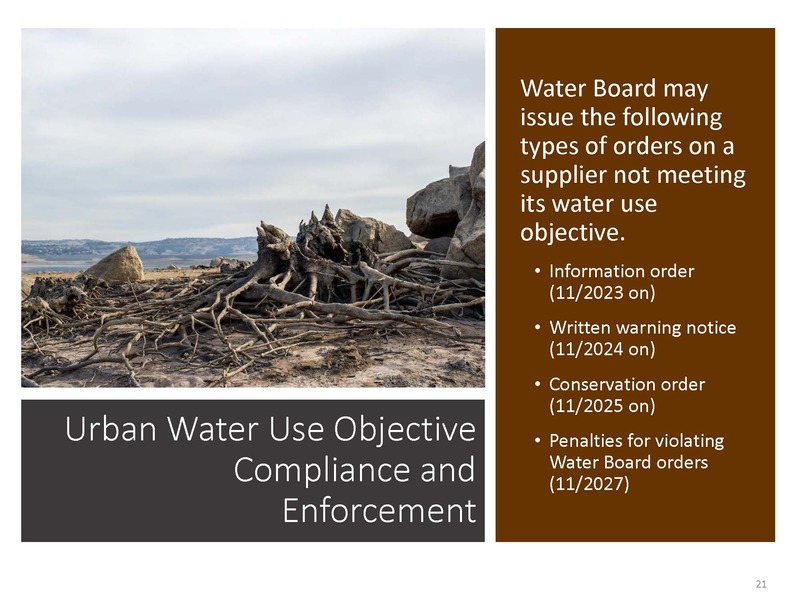 A new five year risk assessment is required of urban water suppliers as part of their urban water management plans with the first one due in July of 2021. 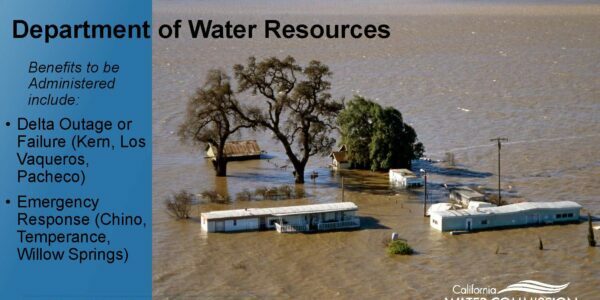 The assessment examines the shortage risks based on the driest five year historic sequence of an agency’s water supply. 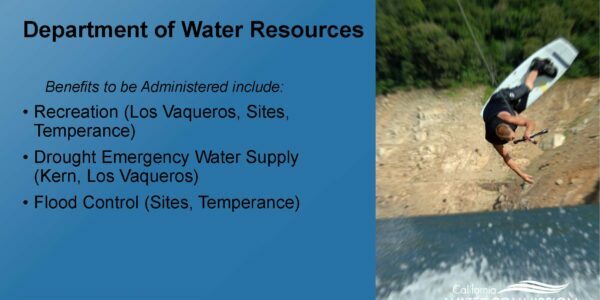 There is also a new annual water supply and demand assessment that will be due June 1st of every year that will ask each water supplier to look at a current year and one more dry years in determining their water shortage risks. It will include information on anticipated shortage, triggered shortage response actions, compliance and enforcement, and communications. In order to be consistent with the agency’s Water Shortage Contingency Plan, the reporting will start in June of 2022. 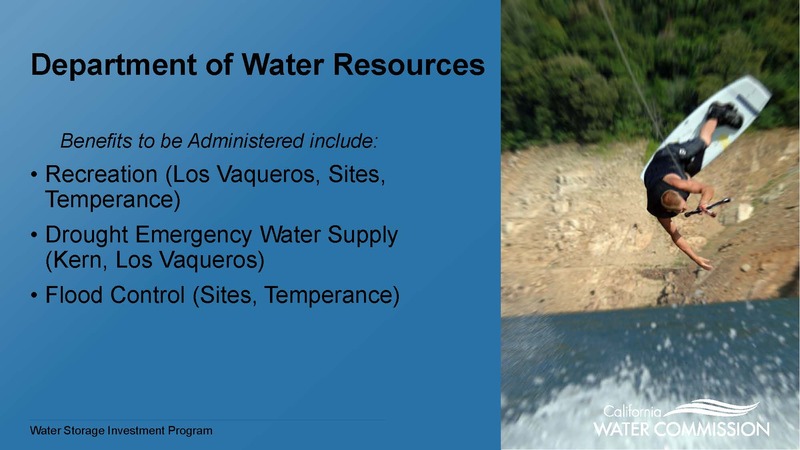 There is also a requirement for DWR to summarize the water shortage assessments and to do an analysis of regional and statewide water supply conditions and present that to the Water Board by September 30 of each year. 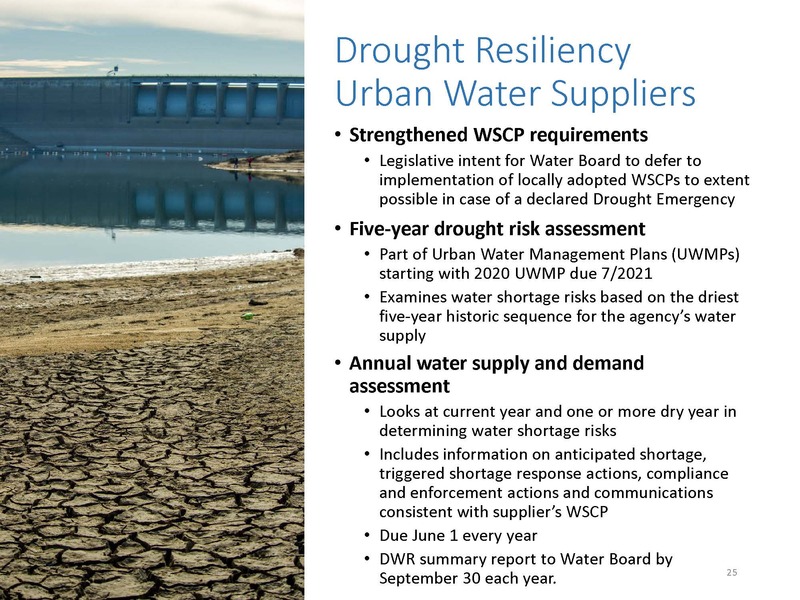 Updated urban water management plans which include water shortage contingency planning and the drought risk assessment are due in July of 2021. 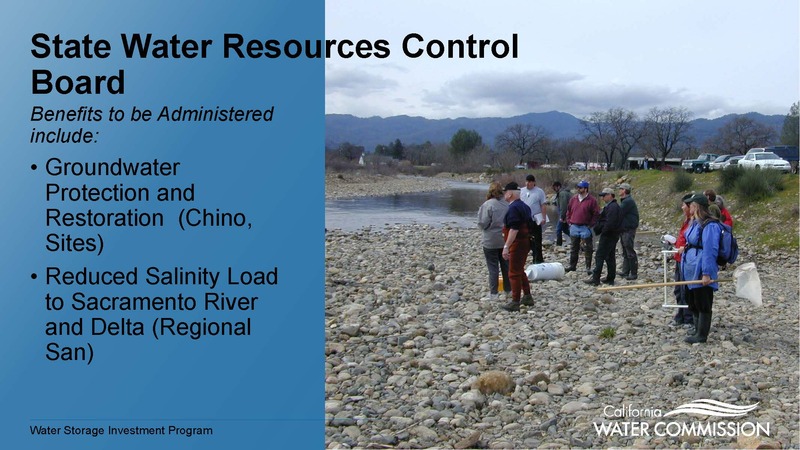 The annual water supply and demand assessment June 1st, 2022; there is the annual water use report that compares the water use with the new water use objectives which is due November 1st, 2023 and every year thereafter. All of these reports are to be submitted to DWR. And then in January 1st, 2024, there’s a supplement to the 2020 urban plan for suppliers to explain how they plan to meet their new objectives. 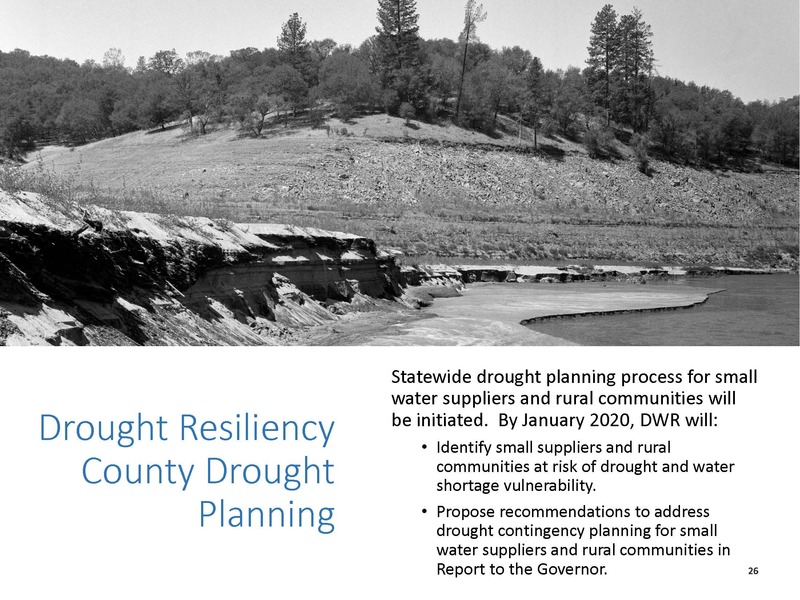 For the rural and small communities, DWR is tasked with identifying small suppliers in rural communities that are at risk of drought and water shortage vulnerability by January 2020 and to do a study working with counties and with stakeholders to propose recommendations on how to best address drought contingency planning for small water suppliers; these recommendations are to be presented in a report to the Governor. There are new requirements for agricultural water suppliers. A new requirement for each water supplier was added to the annual aggregated farm gate delivery reporting to have it be reported by groundwater basin or subbasin starts in 2019. Agricultural water management plans will now have to include annual water budgets, quantification of the efficiency of the agricultural water use within the service areas, and drought planning. The Water Board will conduct the rule making. They are currently in the rule making process to adopt the water loss standards; they will have additional rule makings to adopt the landscape water use standards, the guidelines, the methodologies for the urban water use objectives, the variances, and the CII performance measures. 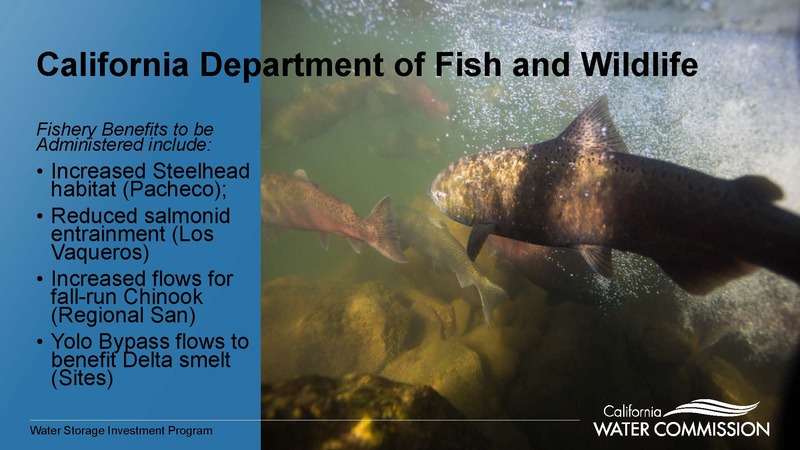 A report by the Legislative Analyst’s Office on the implementation of the new objectives is due in 2024; DWR and the Water Board are to publish a report to the legislature in January 2026. 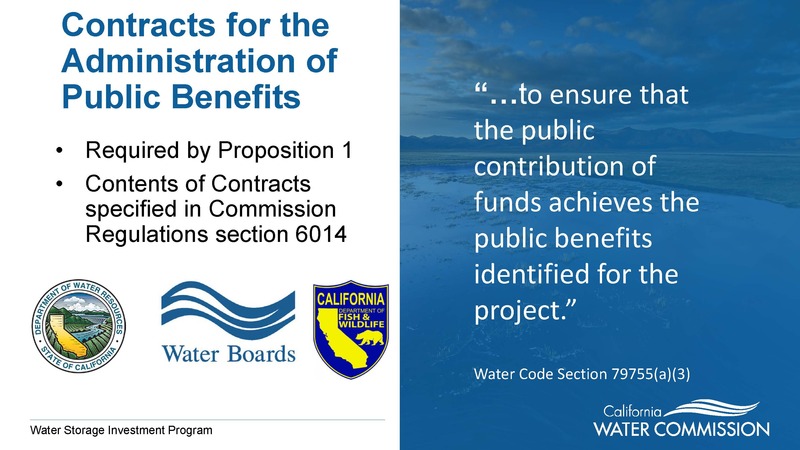 In July 2018, the Commission approved maximum conditional funding amounts for eight projects that applied for funding from the Water Storage Investment Program, a program funded by voter-approved Prop 1. The eight projects range from expanding existing reservoirs to boosting groundwater storage to building new surface storage facilities. However, although approved, the applicants for the eight projects are not anywhere done with the requirements for obtaining the funding. 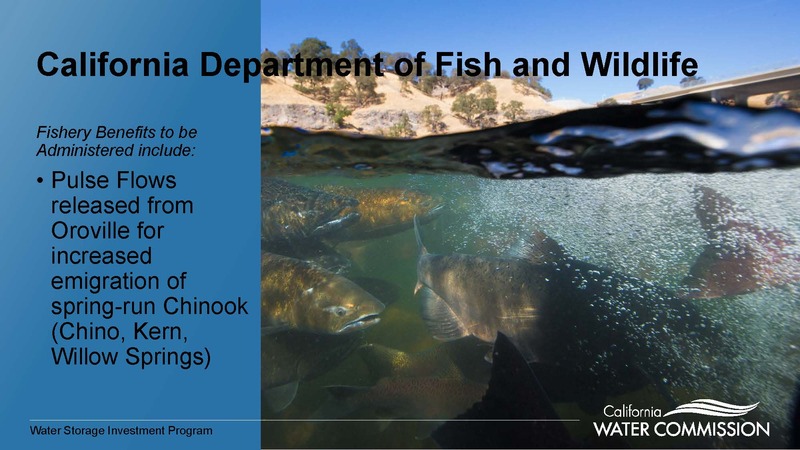 Applicants must now complete the remaining Proposition 1 requirements, including final permits, environmental documents, contracts for the administration of public benefits, and commitments for non-Proposition 1 funding. In accordance with the regulations, the applicants will be submitting quarterly reports documenting the status of the projects as they proceed through the Maximum Conditional Eligibility Determinations (or MCED) process. The first quarterly report was due on October 30, and progress reports were received from all 8 projects. This initial quarterly report included updates to each project’s schedule as well as any updates that were required in the regulations from the application submittal date to the present. Preliminary project schedules were submitted in the first quarterly report and will be updated as necessary. Currently, some applicants forming and implementing JPAs, some are entering into MOUs, some are securing other funding sources, and a few of them are working on their early funding documentation. 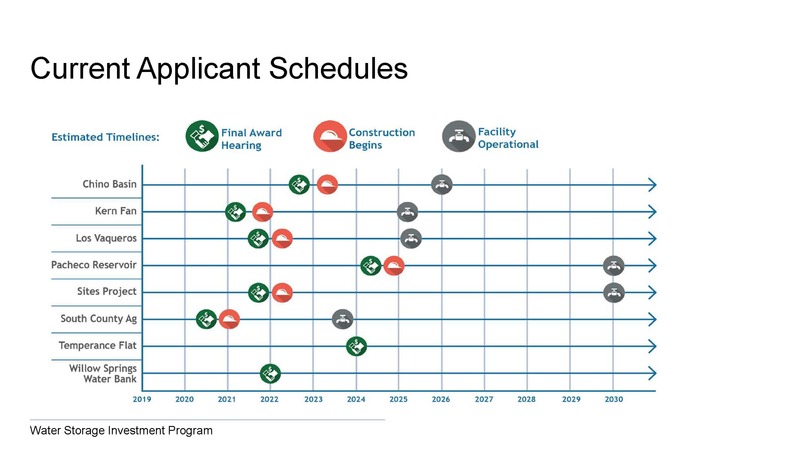 There are three major events on the timeline for each project: Final award hearing, start of construction, and operational start. A final award hearing has been set just before the start of the construction period on each of the projects; this will be refined through time. Three projects have applied for early funding. Commission staff are close to getting the funding agreement executed with Santa Clara Valley Water District for the Pacheco Reservoir project. 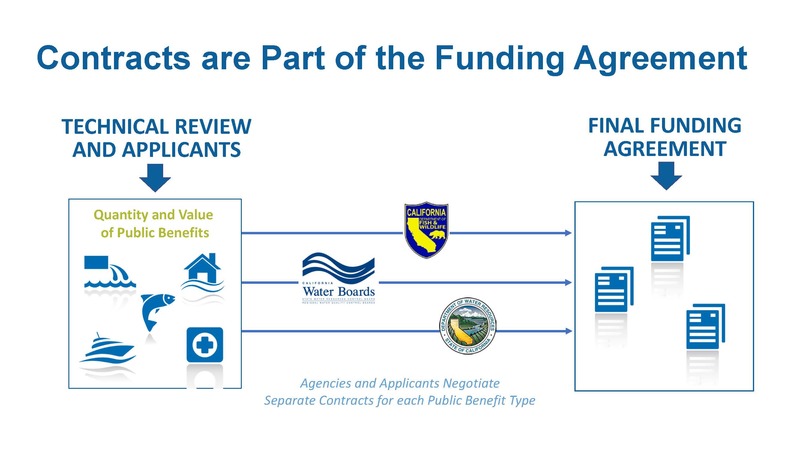 They anticipate that the funding agreement with Contra Costa Water District for the Los Vaqueros Reservoir expansion to be fully executed before the end of this year, and the Sites Project early funding agreement to be executed in the beginning of 2019. The website for the California Water Commission has been redesigned. The new website has a section for the Water Storage Investment Program that has pages for each project that include project application materials, timelines, and more. Staff will work to update individual project timelines as they change. Jennifer Ruffolo, Assistant Executive Officer, then discussed the status of the contracts for the administration of public benefits. She pointed out that it’s a unique requirement of Prop 1 to call for contracts for public benefits. “The statute says that these contracts are to ensure that the public contribution of funds achieves the public benefits identified for the project,” she said. Each applicant will have a contract with the respective agencies that are responsible for administering those public benefits, so a project could potentially have as many as three contracts. The regulations specify quite a bit of the contents contained in the contracts, in particular, the adaptive management plan and a requirement that there be reporting to the administering agency as well as reporting requirements to the Commission. 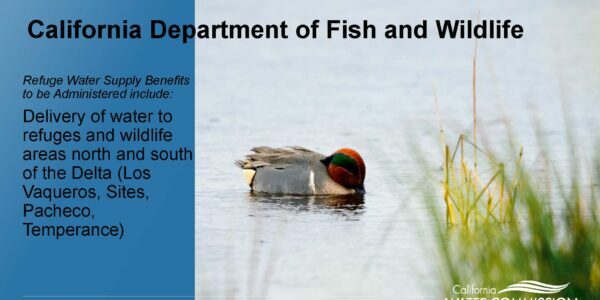 The three agencies administering public benefits are the Department of Fish and Wildlife for ecosystem benefits, the Water Boards for water quality benefits, and the Department of Water Resources for the emergency response, flood, and recreation benefits. 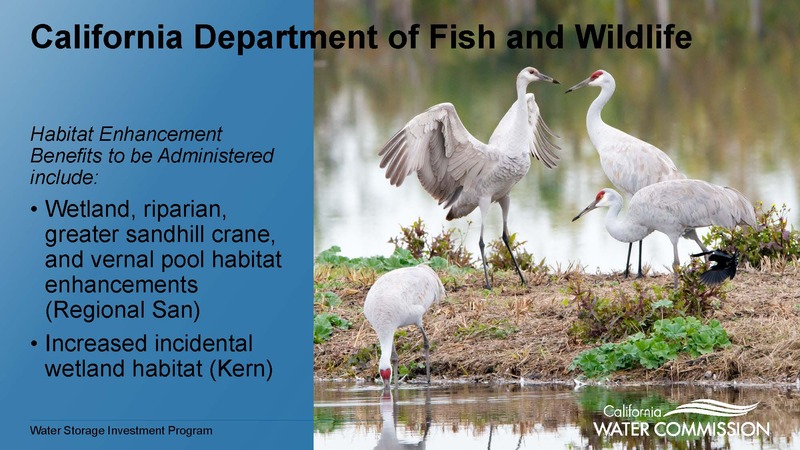 An interagency workgroup comprised of the three agencies has been established to work on the contracts. One conclusion the working group has come to is that the contracts will be a part of the funding agreement. 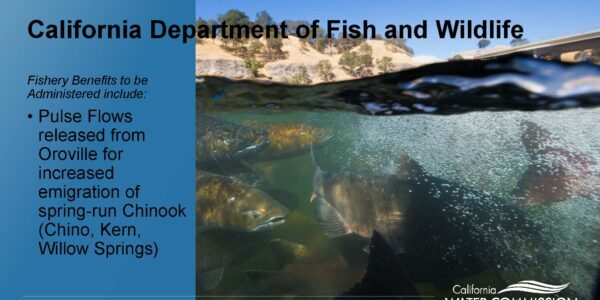 The working group has been discussing issues, such as how the pulse flows work, who has to have an agreement with whom, the timing and how they are triggered, and how that fits into the water year declaration time frame and other planning for operations that DWR and the water projects already do. “We’re keeping track of the issues and trying to keep the program moving forward so that when the applicants get to the point of having their final award hearing, these contracts will have been negotiated,” she said. The contracts will be part of the final funding agreement and each agency will negotiate these contracts separately with the applicants. The applicants will need to work closely with the administering agencies as they obtain their permits and complete their CEQA documents to determine how the benefits will be contracted, recognizing that those benefits may change during the course of the permit process and the environmental review process. Staff is contemplating and planning for an initial meeting with applicants in February to start discussing the specifics of what information the agencies will need and how the applicants envision their benefits rolling forward and to begin those conversations about how to measure, how to monitor, and how to adaptively manage their projects. 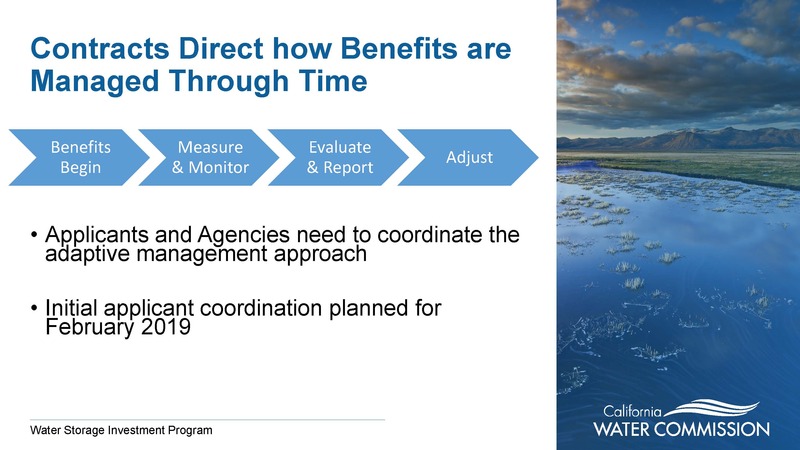 The contracts will direct how the benefits are to be managed through time, so once the benefits begin, there will be the adaptive monitoring cycle of evaluation, measuring, monitoring, evaluating, reporting, and adjusting. This has to happen for the life of the project, be that 40, 50, or 60 years. It may not begin for awhile, so these contracts impose responsibilities on both the applicants and on the agencies for a very long time. Commission staff are tentatively planning an initial coordination meeting with the applicants in February. It probably won’t be a public meetings but they will provide a way for the public to listen in. An initial forum for stakeholder input is being contemplated in May after the first applicant meeting. There is an agreement in concept with the three administrating agencies that the Commission will be able to weigh in on the draft contracts, and there will also be an opportunity for more public comment that occurs at a Commission public meeting. 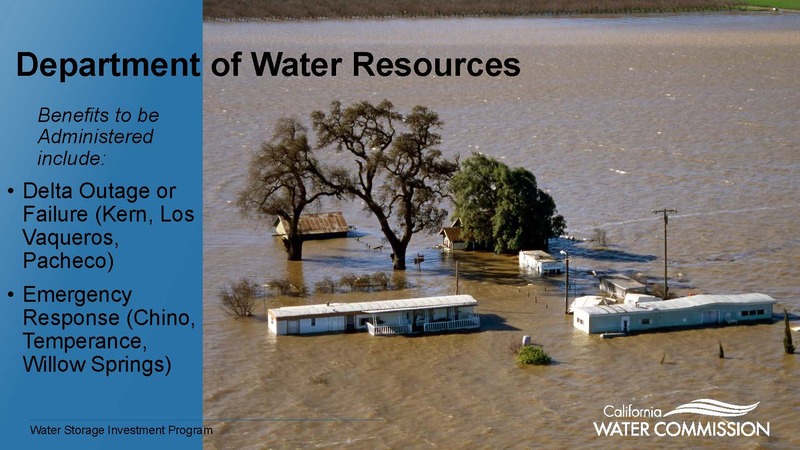 For agenda, meeting materials, and webcast link for the November meeting of the California Water Commission, click here.